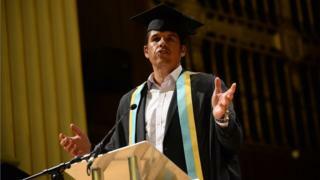 Wales football manager Chris Coleman has received an honorary fellowship from the University of Wales Trinity Saint David. He was awarded the honour during the first of its graduation ceremonies in Swansea. Coleman, who is from the city, played for Crystal Palace, Blackburn and Swansea was capped 32 times for Wales. He became Welsh boss in January 2012 and was appointed an OBE after guiding Wales to the semi-finals of Euro 2016. Then in January, the 47-year-old was awarded an honorary degree from Swansea University. He was presented with his latest honor by Ceredig Emanuel, head of the university’s school of sport, health and outdoor education. Mr. Emanuel said: “It is difficult not to overestimate the effect the Welsh football team’s performance had on our nation. Coleman, who helped Wales to their highest ever Fifa world ranking position of eighth, said he was “ecstatic”. “I’ve failed as many times as I’ve achieved, but it’s not about that, it’s about self-belief and perseverance,” he said. “You’ll have so many doubters along the way – if you haven’t got belief in yourself, you don’t go a long way.